Roughly 15 million people in the U.S. have drinking problems severe enough to merit a diagnosis of alcohol addiction (alcoholism) or serious, non-addicted alcohol abuse. In addition, millions more Americans who don’t qualify for this diagnosis still drink excessively from time to time. In the workplace, alcoholism, alcohol abuse and excessive drinking are fairly common. In turn, drinking on the job can lead to a host of problems for the affected person, that person’s employer and society as a whole. A range of telltale signs may indicate the presence of an alcohol-impaired co-worker or employee. How Common Is Alcohol in the Workplace? If you or your loved one are struggling with the work-related effects of alcoholism or alcohol abuse, enrollment in outpatient or inpatient treatment is a crucial step to recovery. For more information on the effective treatment of alcohol problems, call (888)-459-5511 today. Alcohol use is in decline in some industries and on the increase in others. Every year, alcohol use in the U.S. leads to expenditures that total hundreds of billions of dollars. The federal Centers for Disease Control and Prevention (CDC) report that lost workplace productivity accounts for more than 70 percent of this tremendous social cost, with a price tag of roughly $179 billion annually. One of the main effects of alcohol in the workplace is an increased rate of absenteeism. 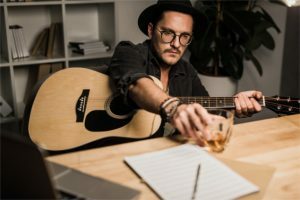 The U.S. Office of Personnel Management estimates that people affected by alcoholism and clinical alcohol abuse fail to show up for work roughly four to eight times more often than their counterparts without diagnosable drinking problems. Close relatives of alcoholics also have a higher-than-average absenteeism rate. Over the past several decades, numerous studies have pointed to the link between alcoholism, alcohol abuse and workplace injury. Compared to nondrinkers, people who consume alcohol may have as much as a 70 percent higher chance of being injured on the job. Even light drinking can lead to increased risk. However, the regular, excessive drinking associated with diagnosable alcohol problems takes a much heavier toll. Almost certainly, workplace injuries help explain the nationwide costs of alcohol-related healthcare. The CDC estimates that such costs are in the range of $28 billion a year. There are several potential responses to alcohol problems in the workplace. Some employers provide intervention through employee assistance programs (EAP) designed to help resolve a wide range of personal issues, including abuse/addiction. As a rule, these programs are staffed by professional counselors who suggest appropriate courses of action. Companies that lack EAP resources may rely on human resources (HR) departments to assist. An EAP counselor or HR representative may ask an alcoholic or alcohol-abusing employee to enroll in a substance program. While receiving treatment, employees typically receive approved leave. Upon completing treatment, they can return to work without facing any repercussions. Follow-up care may be provided in the form of periodic counseling or enrollment in a mutual self-help group. Alcoholism, clinical alcohol abuse, and heavy drinking are serious problems at companies and businesses throughout America. 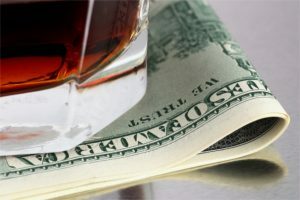 Every year, the nation’s employers lose tens of billions of dollars in productivity for alcohol-related reasons. In addition, people who drink on the job have much higher chances of missing work and experiencing work-related injuries. 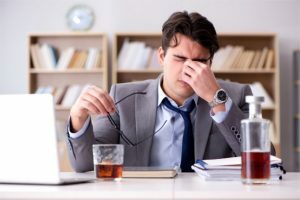 Fortunately, awareness of the signs of alcohol problems can help prevent accidents and other types of workplace incidents. People who receive proper treatment can recover their sobriety and return to productive working life. Enrollment in alcohol treatment is key to preventing alcohol-related problems at work. If you or your loved one have mild, moderate or severe symptoms of alcoholism or alcohol abuse, call (888)-459-5511 for more information on available treatment options.